The University of Turin and Polytechnic University of Turin have joined forces to create a federated competence centre on High-Performance Computing (HPC), Artificial Intelligence (AI) and Big Data Analytics (BDA). A centre capable to collaborate with entrepreneurs to boost their ability to innovate on data-driven technologies and applications. The first goal of HPC4AI is to establish a large and modern laboratory to co-design with industries and SMEs research and technology transfer projects. HPC4AI has been co-funded by Regione Piemonte via EU POR-FESR 2014-2020 with 4.5M€ and will ready for service at beginning of 2019. Research Organisms funded: University of Turin (lead partner), Polytechnic of Turin. The HPC4AI project aims to catalyze the skills already present in the two main Turin's universities in the field of Edge/IoT, Machine Learning, HPC, Big Data Analytics organising them in a federated competence centre. The centre builds on four existing laboratories in the two universities and extends them with high-performance computing systems, which have been explicitly designed to be easily usable by the companies of the territory. The main objective is, in fact, to serve as a lever of competitive technological advantage for the actors of the territory through the ability to create innovation by transforming research into products and services. Innovation cannot be separated from continuous training processes and from young people who are able to think out-of-the-box. HPC4AI aims to meet the strategic need to create within the context universities-local businesses the ability to understand and anticipate market demand in the areas described above, creating a viable, sustainable and sustainable ecosystem. The methodological approach of HPC4AI includes 1) the co-design of research solutions and applications, 2) the enhancement and consolidation of research skills and products. The centre is born around a large computing infrastructure but has a clear focus on the use and development of practitioners and researchers skills. The complexity and scale of the solutions and platforms necessary for experimentation is a significant barrier to entry for every university and SME that seeks to operate independently and independently. It should be remembered that Italy today appears on the list of the 500 most powerful computers in the world with only 6 installations. For this reason, the centre aims to support the research and technology transfer needs with the infrastructures and expertise on the issues related to data-centric computing and its applications. 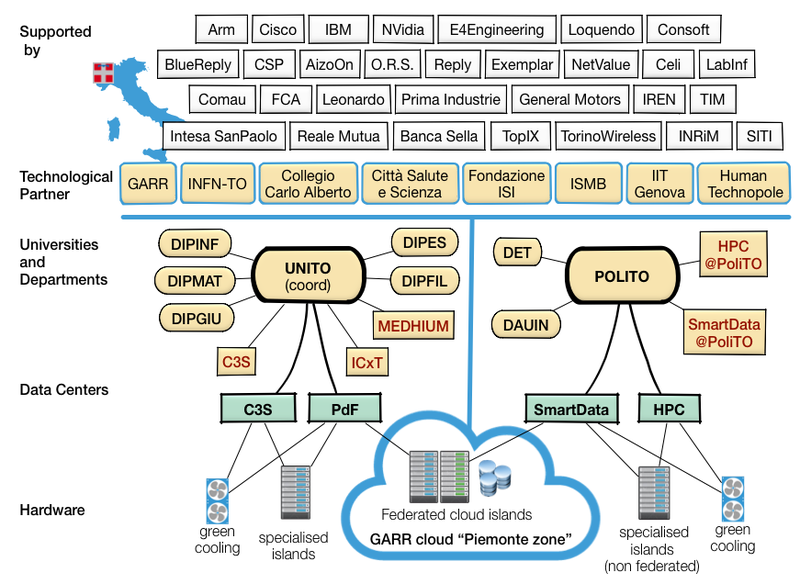 Thanks to the INFRA-P tender of "Regione Piemonte", HPC4AI carries € 4.5M (50% of which come from EU FERS 2014-20) in the construction of a large computing infrastructure distributed in the two universities but federated in one big cloud system, the GARR cloud, open, easily accessible by research centers and companies, able to support the experimentation of applications on a geographical scale in an immediate way. The GARR cloud, in HPC4AI, will be characterized as a high-performance "AI-on-demand" platform specifically designed by UNITO and POLITO researchers to support the development of machine learning solutions (training and inference), BigData analytics, with a market-specific place of solutions for engineering, natural language processing, machine vision. The competitive positioning of the federated cloud platform HPC4AI differs significantly from the comparable commercial platforms because it is clearly oriented to research and technology transfer: 1) It is an open platform (open-source) that can be modified and extended to all levels of abstraction of the cloud services stock to experiment with new features and services. 2) It is an asset aimed at supporting applied research and technology transfer projects in consortia of universities and companies. 3) Implement a marketplace for platforms, services and datasets, where universities and businesses can use, publish and sell innovative cloud services developed in research projects involving local and global data sources. 4) It is an accelerator of collaborative processes between the research world and the production sector, but also between SMEs that need cooperative projects using common technological platforms.